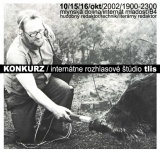 IRŠ Tlis student internet radio (Študentské internátne rádio, Internátne Rozhlasové Štúdio) in Bratislava. It started broadcasting on 22 August 1967 as IRŠ MG (Mladá Garda, Bratislava), and moved in 1980/81 to Mlynská dolina, Bratislava. In 1992 it gave grounds to the foundation of Radio Ragtime, which broadcasted on FM frequency until 1999. Boba Baluchová in the studio, 2007.